The first phone from the ragtag bunch of ex-Nokia employees is due out this month. Jolla has announced its inaugural Sailfish OS handset will be available through Finnish carrier DNA on November 27. For the non-Finns among us, there's no word yet on a wider release. With a sticker price of €399 (about $512/£337/AU$521), Jolla's offering a decent amount of phone for a mid-tier machine. Those who pick up the two-tone phone (to start it's heading mostly to those who made pre-sale orders) will have a 4.5-inch display in their hand, backed by a dual-core processor, 8MP camera and 16GB of storage. There's also a slot for microSD. 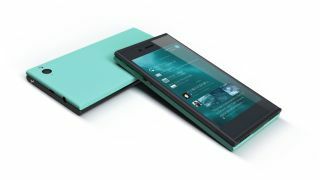 Jolla revealed on Twitter that the phone will be available both on and off contract with no SIM lock. Because nothing beats not getting lost thanks to your phone, Jolla also announced that it struck a deal with Nokia to integrate the latter's Here Maps and positioning tech into Sailfish. Add to that Android app access provided by Yandex.Store and Jolla owners should have a decent suite of software in their Sailfish vessel. Yandex hosts more than 85,000 Android apps "in 17 categories," according to Jolla press release (PDF), including majors like Facebook, Twitter, Foursquare, Skype and Viber. Will Jolla's first phone rock the handset world its core? Not likely, but at least it won't be a dead fish on arrival. Will the Moto G change the smartphone market? Desire Athow thinks so.